Free Shipping Included! mbeat USB-C Hub (USB Type C) Docking Station, supports MacBook Pro, 60W power pass through, 4K HDMI, Ethernet(RJ45), 2 x USB 3.1 Type-A ports, USB-C port, SD memory Card Reader (Space Grey) by mbeat at Pacs BG. MPN: MB-UCD-01. Hurry! Limited time offer. Offer valid only while supplies last. USB-C Hub (USB Type-C) to connect your keyboard, mouse, storage etc. USB-C Docking station with built-in 4K HDMI port and Gigabit Ethernet. USB-C PD hub supports USB Power Delivery up to 20V/3A. 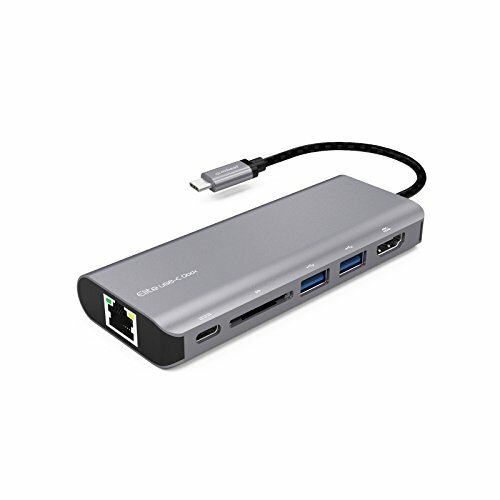 USB-C adapter with SD/SDHC/SDXC memory card reader function Aluminum casing with strengthened connector and braided sleeve able provides long-lasting product life and refined experience. USB-C PD Docking station compatible with USB Type-C Mac and PC devices running macOS, Window 7, 8, 10. No driver needed. If you have any questions about this product by mbeat, contact us by completing and submitting the form below. If you are looking for a specif part number, please include it with your message.